I believe right-first-time is a key metric and mindset for your artwork process and in this article, I continue my series on top tips to improve it, looking at tip 8, ensuring there is an appropriate and scalable suite of IT tools to support the process and the people working with it, and tip 9, ensuring there is quality time and quality facilities to do quality work. Looking first at tip 8 the need for appropriate and scalable IT tools. I am not going to go through every tool in this blog but instead highlight some of the key types. Document management and workflow tools allow you to manage your documents in a controlled electronic environment and route them to key users to perform the process tasks necessary. These tools sometimes also permit planning of artwork projects. Document review and approval tools allow users to view, comment and approve documents electronically (usually with an electronic signature). These above tools are the typical functionality of Artwork Management Systems. Electronic proof reading tools allow you to electronically check text, graphics, barcodes, Braille and, depending on the package, other artwork elements. Artwork and drawing tools are typically used by artwork operators to generate artwork and engineers to create the profiles and templates for components. Two of the ways technology can assist with right-first-time is to automate activities and reduce opportunity for human error. A frequent source of error in a manual process is mistakes with document versions. An electronic document management system can avoid this as they typically provide closed loop version management, automatically version-numbering iterations of a document and ensuring it is obvious which is the most recent version. Human error is always a challenge when proof reading large documents which require long periods of focused attention. Electronic proof-reading tools can assist here by providing an electronic means of proofing that is consistent and accurate. We often hear the same thing when we engage with a client that has undertaken a major technology project – ‘We have implemented a new system but our right-first-time performance has not improved – why?’. The answer to this is pretty simple – application of technology is part of the solution, not the whole solution. If you look back through this set of articles, there are many things that need to be done to raise performance beyond technology: addressing process, people and organisational issues. Missing these means that you are unlikely to achieve an holistic outcome. Another downside is that technology costs money, both in the initial cost of the tool and in implementation, maintenance and support requirements. We often find that people trying to implement systems look only at the initial license costs, which once you have considered project resource and validation costs and ongoing running costs, are a small part of the total lifecycle cost of a system. This total cost is often a surprise. Finally, technology is used by people, and in the case of artwork systems, many of those people may use the system only occasionally (think of the regulatory staff in your different countries). So even a technology project is really about people, as you have to give them the motivation and capability to change and the education and training to be able to use the tools correctly. Therefore, in defining how to move forward with technology you need to consider the needs of your individual company. As a broad generalisation, the technology needs become greater the larger the size of your company. We typically measure this in the number of artworks required. If you have 360,000 artworks to manage you need some sophisticated capabilities. If you only have three, your approach can be much simpler. But remember that technology takes time to implement, so if you are growing fast you need to be thinking ahead. Now let’s turn to my ninth tip which is to make sure there are quality time and quality facilities to do quality work. Reviewing the right-first-time figures at the governance meeting, with sufficient root-causing activity, should highlight areas where the process just seems to ‘get stuck’. Each representative then needs to work to resolve issues that have arisen in their areas of responsibility, in the interests of the whole artwork supply chain. We talked early in this series about the ‘concertina’ effect in artwork projects, where numerous rounds of rework occur but the deadline is fixed so work gets continually squeezed into faster and faster rework cycles. This is a downward spiral as the increasing pressure likely results in either shortcuts being taken or more errors being made. How often have you seen the situation where an artwork has to be sent out at 5pm on a Friday followed by a phone call asking if you have approved it yet? One of the greatest benefits of achieving a high right-first-time is to get out of this whirlwind of rework and chasing. Schedules become more stable and outcomes become more predictable. People get the quality time to do the quality work required because they don’t have to do it again and again. 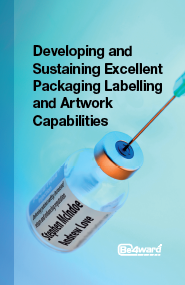 Line clearance procedures in pharmaceutical packaging facilities are a critical quality process. Why? To avoid the risk of cross contamination of products or components from one batch to another. The principle also applies to artwork. A routine source of error is when source information gets mixed up and the wrong documents are compared. This can be a particular risk when there are a number of strengths of a product being compared against a number of reference documents – it can be easy to be looking at a wrong combination. A clean-down of the workspace between each artwork should be undertaken. Most artwork activity is desk-based in offices, but there are some specific facility requirements that should be considered. Proof reading and artwork review needs good lighting, space to lay out large documents and quiet areas. Many of the roles need two screens so they can be looking at an artwork and a set of instructions, or comparing two artworks. Think about the facility and equipment needs of the people who undertake the tasks in your processes. If they don’t have what they need, they will be unlikely to be able to do quality work. In my next article, I will look at the last tip in this series, tip 10 looking at culture and then some summary points to conclude this series.